India remains among the countries with the lowest public health budgets in the world. Its health budget stands at around 1 percent of the GDP. This historical lack of emphasis on the health system is most pertinently captured in former health secretary K Sujatha Rao’s 2017 book, ‘Do We Care? India’s Health System’. The manifestations of the lack of financial and technical wherewithal are reflected in the poor performance of the public healthcare delivery system. Whether it is on the front of user charges restricting the universal access to health services, health infrastructure in a state of severe disrepair, shortage of trained personnel or just the lack of supply of essential medicines, the public healthcare system is severely under assault. This is a result of both continuing austerity measures of the central and state governments as well as the rise of corporate hospitals which seek to maximise profits while paying lip service to social values. Further, both the public and private sectors in healthcare, as evidenced from various growing incidents reported by the media, most notoriously the death of 325 children in August 2017 in Gorakhpur’s BRD Medical College hospital, are hardly held accountable – a situation that the sector avoids with much effort and strategic public relations. In addition, despite India’s recent entry into the World Bank’s classification of middle-income status countries, the ineffectiveness of the Indian health system is more than evident with characteristically low per capita expenditure of Rs 4,600 (as of 2014) and high health-related out-of-pocket hospital payments at roughly 70 percent of the total population. This has pushed around 60 million people below the official poverty line so far. Latest reports by the World Health Organisation, estimate India’s current health expenditure per capita (CHE) as a percentage of GDP at 3.9 percent, which is much lower than the world average of 6.78 percent. This statistic indicates that in countries with a low CHE, the proportion of health to total expenditure is higher among households. In comparison the value for the United States of America is 16.8 percent, where as in Switzerland and Denmark it is 12.1 percent and 10.3 percent respectively. Even Afghanistan at 10.3 percent has a higher CHE as a percentage of GDP. The increased allocations through the National Rural Health Mission (NRHM) launched in April 2005, with its focused attention to rural healthcare especially on 18 states with poor infrastructure and low public health indicators, are gradually leading to positive outcomes in the basic healthcare delivery system. Delivery of healthcare services witnessed a major transformation since 2004, when only one-fifth of the total outpatient care and 40 percent of in-patient care was conducted under the public sector. 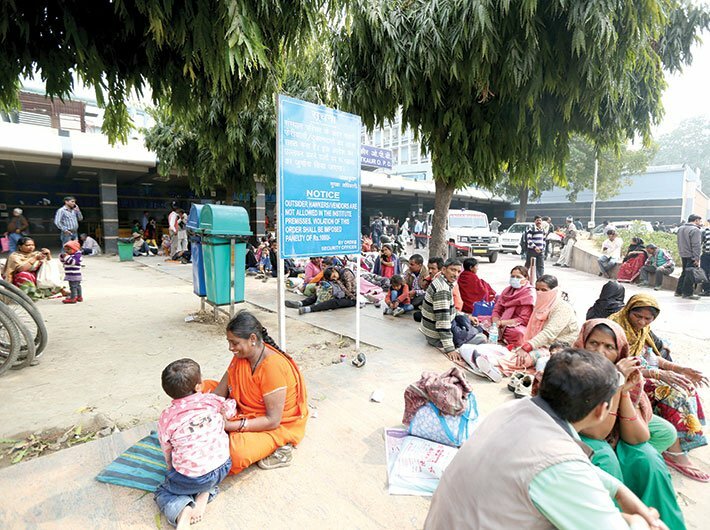 More recently, data from the 2013 Sample Registration System (SRS) points out that childbirths recorded in government hospitals have significantly risen across both urban and rural areas. However, on the other hand, as the NSS 2014 data of the ministry of statistics and programme implementation indicates, the proportion of cost of treatment and place of treatment has been slowly but surely favouring the private sector. While each treatment’s average cost was Rs 5,632 in the public health care sector in rural areas, it was Rs 21,760 in the case of private health care providers in rural areas. The urban figures stood at Rs 26,880 in the public sector with the private sector at a shocking Rs 32,448. Similarly in terms of place of treatment, rural and urban areas accounted for 28 percent and 21 percent for public sector healthcare providers, while the private sector accounted for 72 percent and 79 percent respectively. In this context, aggressive cuts in allocations for the health sector by the current government as evidenced by the meagre Rs 52,800 crore allocated in the 2018-19 central budget as against a projected amount of Rs 8,00,000 crore to meet the National Health Policy target of 2.5 percent of the GDP allocations to health by 2025 is a strong cause for worry. With contentions of fiscal austerity and lack of resources for the social sectors the official stance is to look at alternative sources that can be, and will have to be, tapped in order to generate more resources for health. The recently announced National Health Protection (NHP) scheme, dubbed ‘Modicare’, aims to precisely do this through the promotion of insurance schemes focusing on procedures and treatment in the secondary and tertiary sectors, and also by inviting the private sector through CSR and philanthropic institutions in adopting the health and wellness centres which are projected as the future foundation of India’s health system. Against this background, one needs to analyse the Indian government’s attempt towards universal health care (UHC) more closely. Finance minister Arun Jaitley claims the NHP to be the world’s largest government funded healthcare programme. Juxtapose this with the philosophical underpinnings of the global health movement for UHC – “which advocates health as a human right that governments across the world must be obliged to provide for free of cost”. During the initial years of the 12th five-year plan (2012-17), a high-level expert group was constituted to look into UHC and its definition is particularly illuminating. It stated that all healthcare (preventive, promotive and curative) should be provided to all citizens on a cashless basis to be fully financed by taxes. While fiscal implications as a result of declining economic growth did not see this particular plan come to fruition it also highlighted the issue of the government’s interest in promoting “expensive diagnostic-based hospital treatment that had the backing of the corporate sector” as is noted by Rao in her book. Under the continuing policy framework of the BJP-led NDA government many of these issues still seem pertinent. The larger question, which is absent in most mainstream discourses on healthcare, is to figure out how these new alternative funds generated through insurance schemes and other methods including taxes will be spent: Will it lead to an expansion of the existing public healthcare delivery system, or will the insurance-based, private sector dependant platform become more dominant, or will it take the turn of a circumspect combination of the two? Whatever the prospects, the marginalised and dispossessed should not be made victims to suffer further ill health. The average Indian citizen needs a more accountable and effective health system without being forced to pay exorbitant fees to access a primary need such as good healthcare. Vivek is a PhD research scholar at the department of political science, University of Hyderabad.